As with all precious stones the weight of a diamond is expressed in carats. The word carat originated in a natural unit of weight; the seeds of the carob tree. Diamonds were traditionally weighed against these seeds until the system was standardised and one carat was fixed at 0.2grams. One carat is divided into 100 “ points “ so that a diamond of 25 points is described as a quarter of a carat or 0.25carats. Size is an obvious factor in determining the value of a diamond, however two diamonds of the same size can have very different values depending on colour, clarity and cut. Almost all diamonds contain minute traces of non-crystallized carbon or small non-diamond crystals. Most are not discernable to the naked eye and require magnification to become apparent. Called inclusions, they are natures fingerprint and make every diamond unique. However the fewer there are, the rarer the stone will be. Although most diamonds appear white, many display hints of colour that are not always noticeable to the naked eye. The more colourless the diamond the rarer and more valuable the stone. The colour of a diamond is expressed as follows in descending order; D (colourless), E, F, G, H, I, J, K and L.
Rare stones of exceptional colour – green, red, blue, pink or amber are known as fancies and are extremely valuable. Cut is the only factor influenced by man in the value of a diamond, the others are all determined by nature. It is the polishers skill that releases the fire, brilliance and sparkle of the diamond. The way a diamond is cut enables a diamond to make best use of the light. When a diamond is cut to good proportions light is reflected from one facet to another and then dispersed through the crown at the top of the stone. The shape of the diamond depends on personal taste but the most popular are the brilliant cut (round), princess cut (square), pear shape, emerald cut (octagonal), trillion cut (triangular). At Kathryn King Designer Jewellery we use G Colour, VS1-VS2 Diamonds and can supply them in any cut or weight. Other qualities of Diamond are available to order. Diamonds do need care to keep them at their brilliant best. A clean Diamond not only reflects light better, but actually looks bigger than one that’s been ‘dulled’ by skin oils, soap, cosmetics and cooking grease. 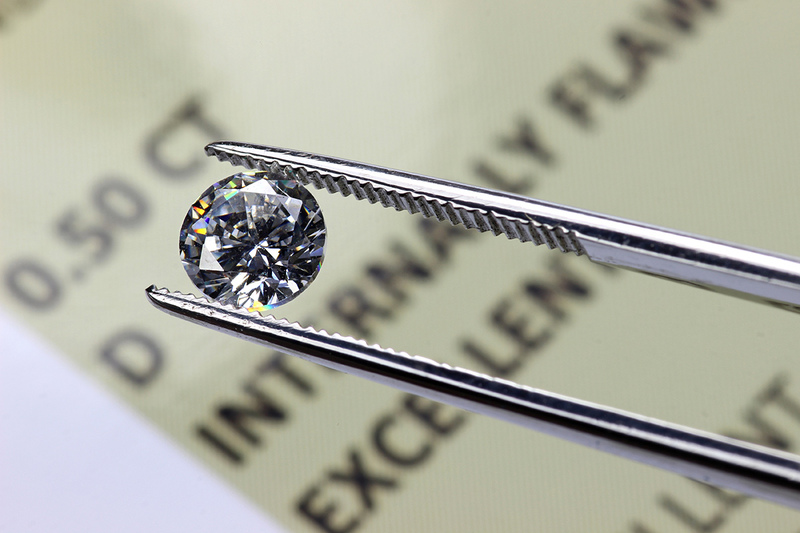 Diamonds have an affinity for grease and should be cleaned once a month to keep their fire at it’s brightest. Warm water, fairy liquid and an old toothbrush are all you need!